All good things must come to an end. 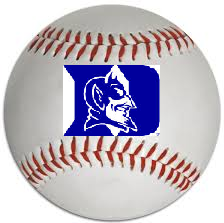 After starting the 2014 season 2-0, the Duke baseball team lost their finale at home to Binghamton by a 7-6 final. The Blue Devils still won the series, 2-1. Through five innings, the Blue Devils had collected just two hits off Binghamton starter Jake Cryts (though he issued four walks). Both hits were erased by double plays to end the inning. By then, Duke trailed 4-0. After Cryts left the game after five shutout innings, the Blue Devils offense went to work. They scored three runs in the seventh to cut the deficit to 4-3. They would go on to score three more runs in the eighth. Problem is, Binghamton scored three runs in the top of the 8th inning. The Duke bullpen had pitched well up until that point (Conner Stevens threw two one-hit innings of relief). Sarkis Ohanian and Kevin Lewallyncombined to allow three hits, two walks, and three runs in the eighth (the walks and runs were all charged to Ohanian). James Marvel made his first weekend start and allowed four runs on eight hits and three walks over 4.2 innings to take the loss for Duke. On offense for the Blue Devils, Grant McCabe (he of the first hit) went 2-for-4 with a run scored. Kenny Koplove went 2-for-5 with a run scored and an RBI. Mark Lumpa went 2-for-3 with a walk and a run scored. For Binghamton, five hitters had multi-hit games. Seven of their 12 hits came from their first three batters. Next up for Duke is a midweek game at UNC-Greensboro on Tuesday.